We are proud to bring you another installment in our Firebird Dinner Series in which we've partnered with ROAK Brewery. Join us Saturday, March 9th 2019 from 5-8pm for another fun and memorable experience. The evening will begin with ‘happy’ hour from 5:00pm-6:00pm in which each guest will receive two welcome ROAK beers meant to excite and awaken the palate. Following “happy” hour is a 4-course meal carefully paired with craft brews from ROAK brewery located here in Royal Oak, MI. Most of these featured beers are available for a very limited time or only served at the brewery itself. 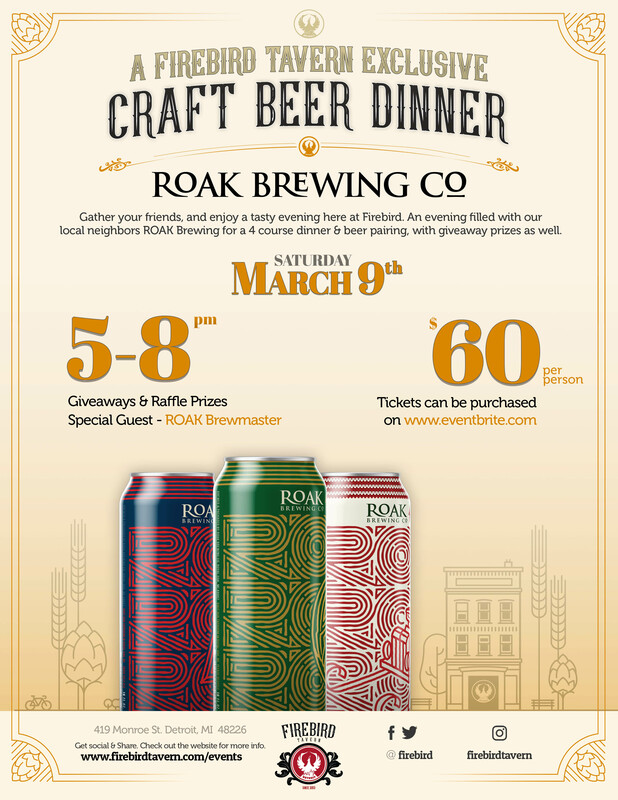 Brandon MacClaren, ROAK brewmaster, will be on hand to discuss the pairings, share his passion for brewing and a bit about the ROAK brand itself. 21+ only. Seating is very limited. 12/31/2016 Firebird NYE Party Join us for New Years 2017! 07/14/2016 Founders Brewery Strolling Dinner Strolling dinner with one of Michigan's most award winning breweries! 12/31/2017 New Years Bash 2018!! Join us for New Years Eve 2018! !